Welcome to the latest edition of Warbirds here at The Clockwork Conservative. Today we’ll be showcasing (and celebrating the first flight of) America’s first strategic jet bomber – the B-45 Tornado. Development on this sleek aircraft began when the War Department grew increasingly concerned over long-range, high-speed German bombers like the Arado Ar 234. The ability to outrun conventional fighter aircraft could give an enemy to strike with impunity within the jet’s range. The design proposal put forward by North American Aviation won in mid-1944. In September of that year, construction began on the first 3 prototypes. To fulfill the imagined bombing, reconnaissance, and nuclear weapon delivery roles, the Tornado featured a pilot, co-pilot, bombardier/navigator, and tail gunner crew configuration. Four jet engines (sometimes augmented with rocket assisted launch equipment) allowed for a payload of 22,000 lbs. Her initial 1000 mile range was augmented by the inclusion of in-flight refueling capacity. The B-45 was the world’s first operational jet bomber to perform an inflight refueling. 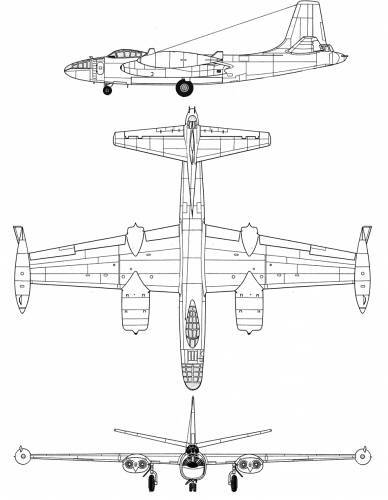 The B-45’s development proceeded rapidly and the U.S. Army Air Force issued a preliminary contract with an eye towards fielding 5 light bomb groups and another 3 reconnaissance groups. With the heating up of the Cold War, pressure to aviation technology was tremendous. By the time that the initial Tornados were delivered, plans for its use were already being scaled back in favor of even more advanced jets. Only 143 B-45 variants were ever produced. With the opening of the Korean War, the B-45 finally got the opportunity to prove her value. In both bombing and reconnaissance roles, the Tornado performed yeoman’s work. Daylight bombing runs at altitude were the rule until an RB-45 was nearly lost to MiG-15 fighter jet in 1952. After that, the remaining deployed aircraft were converted for nighttime operations. In 1952, with Cold War tensions rising, many of the other B-45’s were forward positioned at bases in the United Kingdom. However, before the transatlantic flight to Sculthorpe, the Tornados were upgraded to be capable of deploying the new compact generation of nuclear weapon. The threat of their payloads and proximity to the Soviet bloc countries added a significant deterrent. Several of the RB-45C reconnaissance variant were seconded to the Royal Air Force so that they could perform clandestine intelligence gathering flights over communist territory when such missions by American forces were prohibited by the President. This value of this type of successful intelligence gathering mission would lead to the development of the U-2 and later the SR-71 Blackbird. Unfortunately, with advent of bigger, faster, and more capable jet bombers, the days of the B-45 were numbered. By 1958, the last U.S.A.F. B-45’s were withdrawn from service and R.A.F. aircraft were soon to follow. 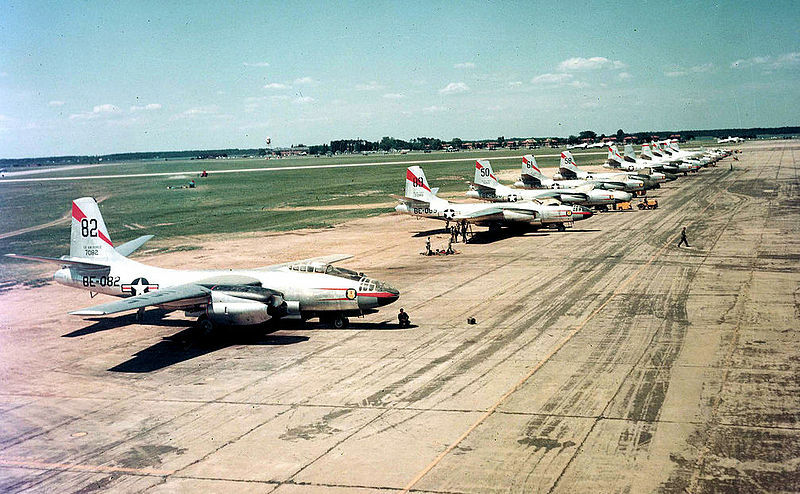 The last few Tornados served as trainers and later test platforms through the early 1970’s.